To Sum It Up: Freya, Harun, and Nathaniel are three very different people leading three very different lives, but they do have one thing in common. They have all reached turning points and know they are on the edge of something. A freak accident brings them all together, and in each other, they begin to find the intangible piece that’s been missing from each of their lives. Review: On the rare occasion when I read contemporary, Gayle Forman is my go-to author for the genre, and she hasn’t disappointed me yet. 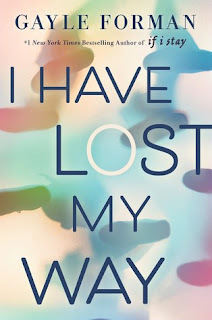 Her latest novel, I Have Lost My Way, is another page-turner, centered around three strangers who meet by what seems like chance. Thanks to her magical storytelling, though, Forman convinces you that these three characters were absolutely meant to find each other. I Have Lost My Way has a fairly simple premise that belies how deep the characters and the story are. I should say “stories,” because the book not only follows the development of the friendship between the three main characters—Freya, Harun, and Nathaniel—but it also explores their individual backstories. The book switches between third person omniscient and first person narration. Through the latter, we learn how the title applies to each character. Freya is an up-and-coming singer who mysteriously loses her voice in the middle of recording her debut album. Harun is nursing a broken heart but can’t tell anyone, especially his traditional parents, because no one knows he’s gay. Nathaniel’s character poses a bit of an enigma, but as the puzzle pieces fall into place, what emerges is a story that will shatter your heart. It’s been a while since a book captured my attention almost instantly and held it all the way to the last page. I devoted every spare second I had to reading this and was reluctant to put it down whenever real life called. Gayle Forman is so gifted at writing characters you feel compelled to read about and care about. I also loved her beautiful portrayal of the diversity that makes New York the greatest city in the world (in this native New Yorker’s not so humble opinion). If you enjoy exquisite storytelling with characters so authentic they could step right out of the pages, then this book is a must-read. All in All: Another winning novel from Gayle Forman. Contemporary usually isn’t my cup of tea, but her books, including this one, are always compulsively readable.